Tuesday 2006-05-09 was the Europe Day. I traveled to Tampere for a show debate. I’m a member of the University of Helsinki Debating Society. We do British Parliamentary debating for fun. The Debating Society had promised that we would provide four debaters and a chair person for a show debate with four members of the European Parliament (Piia-Noora Kauppi, Satu Hassi, Riitta Myller and Kyösti Virrankoski). 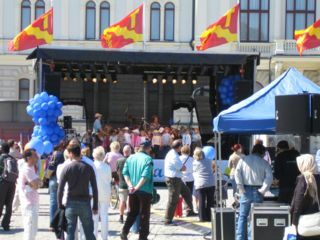 The debate was planned to be a part of the main Europe Day festivities in Finland. Tampere was the hosting city this year. The plan was that there would be four teams (like there should in BP) with one MEP and one Debating Society member on each team. However, the organizers wanted to make it shorter, so the configuration was changed so that there were two MEPs on each side and one Debating Society member on each side as a summary speaker (which obviously is not real BP anymore). Timo and I were chosen as the two summary speakers and Scott came as the chair person. We took the train with Rich to Tampere. The city square where the festivities were taking place was nicely at a walking distance from the railway station. When we arrived, there were children from the English school of Tampere singing on the stage. It was rather weird programming for the Europe Day, because their accent sounded more American than European. Then there was a band that was loud, but we did not actually listen to them. We settled on the motion “This House Would Create a Social Europe”. Riitta Myller was chosen as the first proposition speaker and Kyösti Virrankoski as the first opposition speaker. Satu Hassi got second prop and Piia-Noora Kauppi second opp. I took the summary position for the proposition and Timo took the summary position of the opposition. We had practically zero preparation time. The debate that was heard was quite different from the ones you’d hear in a BP tournament, which was not unexpected. The sides were pretty much in agreement, but the proposition side said that they wanted to create a social Europe and the opposition said that Europe is not a social Europe. I think Kauppi managed to give the most debating-as-a-verbal-sport type of speech. I should say that the usual debating disclaimers about the opinions expressed not necessarily being real opinions applied. Keeping that in mind, there were a couple excellent point made. Myller said that the freedom of business is different from the freedom of the people. (My comment: Next time you hear a self-proclaimed leader of the Free World talk about exporting freedom, think which one he is actually talking about.) Virrankoski pointed out that the freedoms on the flow of goods do not take into account if the good came into being in a socially sound way. Hassi pointed out that Americans are wealthier in monetary terms the Europeans, but according to studies on the self-assessment of happiness, Europeans are happier than Americans. After a certain threshold of economic wealth has been achieved, it is difficult to create more happiness by boosting the economy. I went up as the first summary speaker. Although the debate was less polarized than a usual debating-as-a-verbal-sport debate, I still tried to do the “obviously the argument falls on our side of the House” routine. I basically summarized and invoked Hume’s Guillotine on the opposition. Timo was able to summarize more vividly. More interesting than the debate itself was the opportunity to talk with the MEPs later. I talked mainly with Hassi and Kauppi. It’s always nice to talk with politicians who are clued about copyright and patent issues. In retrospect, though, I probably should have taken the opportunity to see if Myller and Virrankoski were clued about these issues, too. Later, there was a panel discussion organized by the Tampere-based Aamulehti newspaper. In addition to the four MEPs, Finland’s commissioner Olli Rehn was on the panel. I’m not going to summarize the whole thing, but here are a few points. On the topic of why the EU has such a low approval rating, Kauppi said that the EU has an implementation deficit. There has been lots of talk and less acting on the promises, which, she claimed, does not fit well with the Finnish mentality. She also said that local politicians like to blame things on the EU. The panelists were asked what they thought was the dumbest directive. Virrankoski said the directive that prohibits the disposal of dead farm animals on the spot by burying or burning. Kauppi or Myller (can’t remember for sure) said the regulation that prohibits the traditional slaughter of reindeer outside and requires the semi-wild animals to be loaded in a transportation vehicle. Hassi said the directive that regulates the water testing on swimming beaches and was designed for Riviera-style beaches and does not make sense in Finland. Rehn chose the directive on the shape and size of strawberries and cherries. Since the topic was dumb directives, I asked how the Parliament and the Commission are doing to get rid of directives that are found useless in impact studies such as the database directive that was deemed not achieving its stated goals. The moderator directed the question to Kauppi, who said that such directives should be revised or repealed. I wanted to bring up the issue so that the commissioner, the journalists and the audience heard it. (That is, impact studies are being done, which is good, and bad policy is found.) Update: I got about 15 square centimeters of fame in Aamulehti with 18 words attributed to me and a photo, which was nice. There were some very anti-EU elderly people in the audience. One called for the dismantling of the EU and also asked what business Cheney has promising support to potential EU member candidates. Scott and Timo wanted to get going, so we left before the discussion was over and headed back to the railway station.